Knowing average retirement savings for your age can give you a good idea of how you stack up for your ride into the sunset. The hard part of thinking about retirement is that it’s often discussed with charts and numbers in the abstract. It helps when you can see the actual steps and actual person took to save for their retirement. To prove it, we talked to four different readers about their retirement savings. What they told us was revealing, fascinating, AND occasionally contradictory to typical investment advice. What’s your job? IT coordinator at a consulting firm. How confident do you feel about your retirement plans? I don’t feel very confident about my retirement plans so far. The amount we have saved is lower than where I’d like it to be but I know these things take time to evolve. When did you start saving for your retirement fund? I started when I got my first full-time job out of college. It was cool because I literally started with nothing and it’s been amazing to watch it grow, even though only around $63 gets taken out of my paycheck each week. Have you always had a saving mentality? For a lot of my adolescence we were living off of just my mom’s wages. I’m not exactly sure how much she made, it must have been less than than $30,000 a year on a waitress’s salary. And then whatever she got from my dad for child support and food stamps. We lived paycheck to paycheck with a “we got to put food on the table” sort of mentality. So initially, I didn’t really have a model for saving money. Did your parents have any tactics to help you get by? Mom would always bring home the food she was given for dinner to my sister and I. At the time, I never worried about what she was eating, but I know she made a lot of sacrifices to keep food on the table for us. I also never had an “allowance” like most kids get. I did have a very frugal mindset from watching what my parents did with their money though. Once I had that surplus for the first time in my life, I started to get into the habit of saving as much as I can for the future. What advice would you give your younger self? It doesn’t take a lot to be mindful about how much you can save. I think a lot of people get bogged down in the numbers. “Oh man, I only made $200 this pay period. I need to use this X of it just to live!” so they use the fact that saving a small amount doesn’t feel as good. BUT it can be just as impactful later on. If I saved earlier, no matter how small the amount, I would be in an even better situation now. Also, I’d tell him to go to a cheaper school. I went to an out of state school and put myself in way more debt than I realized. I think I ended college with a little over $30,000 of debt. I could have easily gotten an associates from a local college and then went off to a university for two years to get my bachelors and saved my parents and I tens of thousands of dollars. Rent or own? Own a house. 15-year fixed rate mortgage $2,800 / month. What’s your job? Associate director of strategy for an insurance company. What advice would you give your younger self when it comes to saving for retirement? Spend your money before you have it. Every Monday morning, I sit down and go through all the expenses I have for the week. I also look back at the last week to see how my expenses compares to my budget. I set up a week-by-week budget for each month too. That’s helped me figure out that if I set away a little bit of money specifically for fun purchases like restaurants or going out, you have more money than you think to go towards saving for retirement. Making sure I knew where I wanted it to go was very important for me. When did you start saving for retirement? I started when I was able to get a job after school. It was very basic: I contributed 6% of my income while getting a 4% employee match. How did it evolve over time? I just kept doing that for five years until about 2014. I went from contributing enough to hit the employer contribution to enough to max out the 401k at $18,000 a year. I don’t have a Roth IRA or anything like that. Do you feel confident about your retirement plans? Very. We’re investing very aggressively right now — we have less than 10% in bonds and the rest are in equities. We also saved about $20,000 for the baby on top of another $20,000 we have for emergencies. So if we have some unforeseen expenses come up, we have the money there. How does your newborn impact your finances? A lot. [laughs] Our ultimate goal is to be financially independent by the time we’re 40, though to be more realistic it’ll be closer to 50. That was our plan — BUT our baby coming along threw us a curveball. Why do you want to be financially independent? We look at the people around us — our parents, former bosses, colleagues — and they’ve spent their whole careers in this rat race doing jobs maybe they enjoyed but were ultimately grueling. Then you get to age 60 or 65 and THEN you’re supposed to enjoy your life? We’ve seen people get there and struggle to enjoy it or not enjoy it at all. My wife and I don’t want to wait. Is there anything keeping you from enjoying life now? I have a really good life now, so it’s not so I can enjoy my life more necessarily. It’d just give us a much greater work flexibility. It would just allow us to pursue the work that we’re really passionate about easier since we won’t have to worry about paying the bills. What concerns you most with your retirement savings? Once we get to that point where we’re financially independent, then comes questions like, “Are my wife and I healthy enough? What if there’s an unexpected health emergency we haven’t thought about?” Then I wonder if there’s any sort of risk that we haven’t thought about that we’re not protected against. Have you always had that fear? It goes beyond all the money we’ve saved. We’ve done all this hard work. We’ve saved all this money to protect ourselves against major financial issues … but is there something else we should be thinking about? I don’t know. Do you feel like that’s more exasperated since having your baby? For sure. One thing we started doing differently is keeping more liquid cash on hand in case we need a safety net. Before we had our baby, I was much more concerned with putting all the extra money I had towards debt or investing it. How much liquid cash do you have? Just under $40,000. We’re still saving for it now. Any specific tactics that have helped you with your investing? Automating my savings. I highly suggest everyone do the same. Once you set up the money in your accounts to save automatically, you can build your life around what ends up in your personal checking account to spend. That’s huge for my wife and I. Whenever we get raises or our paychecks, we can automate it to go where it needs to go. What’s your job? I work as an architect in my 9-to-5, but the thing I’m most involved in is investing through a real estate company I co-founded. That’s very non-traditional. How has it worked out? The strategy was to buy at a reasonable price and achieve stable returns. I’d rather spend my time and money investing in areas that I have more of a control over. What did your retirement savings look like in the beginning? I started my retirement by doing a number of things. First, I lived in my wife’s parent’s basement for four years. During that time, I worked as an architect for a firm and I saved money through a traditional 401k. I felt like I was spinning my wheels though because I felt like I didn’t have control over it. Also I had my student loans to worry about. What are you most worried about when it comes to saving in the future? Why? I’m torn between worrying about saving too much and not saving enough. What is the right amount? How do you balance current spending with future savings? Also things that are totally outside of my control like what happens if the real estate market crashes tomorrow? That affects the vast majority of investments I’m focused on at the moment. Why are you worried about saving too much? You can really put yourself in a bind by saving too aggressively — especially for retirement. I think you can plan to some extent about the things that can happen but you never know what can happen. You can save and try to plan but you can really sacrifice too much of your current life if you focus on saving too aggressively. Do you know if/when you’ll ever retire? For me, I’m viewing leaving my current job as “retiring,” because I’m going from needing to work to wanting to work. As soon as I can stop worrying about needing to work and I can focus on what I want to do, I’ll have retired. Why don’t more view retirement this way? That’s actually something that bums me out about people’s choice when it comes to retirement. They’ll work jobs they hate for years and year and then “retire” to go do things they could have been doing the entire time. What’s your best piece of advice for retirement savings? My wife and I have been pretty fortunate that we’ve been able to travel a lot. People always ask us, “How do you do it?” The reality is I don’t make a lot more money than they do. I just use my money intentionally. For example, I spend money on travel and an INSANE amount of coffee, because I love those things. It actually helps you save money for things like retirement when you spend money on things you care about. It’s pretty powerful. What’s your job? I’m an interior designer and I run my own photography studio on the side. Why are you investing so aggressively at the age of 48? We’re planning on working another 20 years until we retire. I’m not military. I don’t work for the government. I won’t have a pension. What advice would you give to your younger self if you could? Start saving early — even if it’s just a little bit. I didn’t have as much money as I thought I should for a Roth or these other basic investments, but I should have started out with whatever it was even if it was just $50 a month. Just start. Keep it rolling. Then it’s on your radar. It is moving. When did you start saving for your retirement fund? Right away after college. In my mid-twenties I started contributing to my employer’s 401k. Do you feel confident with your retirement plans? No. I think we’re under. Before kids, we were really putting money away but once we had kids she got laid off from her job. Very bad luck because she was the breadwinner then. So we had about four to five years where she was unemployed and stayed home with the kids. Our retirement could easily be double what it currently is if it weren’t for those four to five years. We missed out on an enormous amount of money. What do you mean it could be double what it is now? It’s been 10 years since she was laid off. That income would have provided more than $1 million in gross pay. All that compounding for a decade would have made all the difference in the world. How would you describe your life now to before your wife was laid off? While she working we made more than enough to save for our future and enjoy life – travel, eat out frequently with friends, etc. I wouldn’t say we’ve cut out that much more, just greatly reduced the frequency. We used to spend a weekend in NYC each month, now we go maybe twice a year. We have to be a lot more thoughtful in terms of going out and socializing. Even entertaining at home can be a pricey affair. We still do these things, just less than we’d like. How has your savings strategy changed since your wife was laid off? I’m earning more now which is good, but it’s still tough. It’s part of the reason why I started picking up my side business. It’s my “keep us sane” play money. At our age, you have to enjoy life. What investment does your wife have? Now she runs her own marketing business, so she contributes to an SEP IRA — it’s like a Roth IRA specifically for self-employed people. The beautiful thing about that is that when you’re self employed, you’re absolutely hammered by taxes — something like 33.3% goes away! You can contribute way more to a SEP IRA than you can to a Roth IRA. It’s a beautiful thing because it takes your taxable earnings way down. What did you learn from becoming a one-income household? The good thing that came out of this is that we really started paying attention to our money flow. I got really obsessed with tracking our expenses and income. We got hypervigilant. They all wish they started earlier. It’s so fascinating that each of the readers wished they could tell themselves to start saving earlier — no matter how little it was. If you’re reading this, and you’re still relatively young, that’s awesome! If you’re a bit older though and feel like you’re behind, don’t worry, because..
There’s no one way to do things. From Peter and Scott’s hustles to Dakota and Tim’s 401k employer match, each of these readers approach their savings differently. That means if you’re just starting that’s great. We want to show you how you can save for retirement. With retirement accounts, you’ll be able to accrue gains with big tax advantages with one caveat: You promise to save and invest long term. That means you can buy and sell shares of almost anything as often as you want as long as you leave the money in your account until you get near retirement age. We’ll talk about those exceptions a little later, but for now just know that retirement accounts give you a HUGE advantage over regular investment accounts but can tie up your money in the short term, penalizing you for withdrawing before a certain date. But what is a 401k and Roth IRA? Do you have to jump through a lot of hoops to get them? How much do you have to invest each month? When you invest in a 401k, your money goes into an investment account where a professional investing company manages it. Typically, your employer gives you different investment options to choose from (aggressive, international, mixed, etc). Your company does most of the work when you set up the 401k and you’ll often be able to instruct them to automatically withdraw a certain amount from every paycheck. And don’t worry about switching jobs. If you should ever decide to leave your company, you can take your 401k with you. When can I take my money out? The money you invest in your 401k must stay in the account until you are 59 ½ years old. If you take the money out before then, you’ll get slapped with a 10% federal tax penalty on your funds. If you want to maximize your returns for your 401k, make sure you leave it in there until you’re ready to retire. When you do take it out, you are going to have to pay income tax so it’s not completely tax-free. But 401ks are only one part of the equation when you want to start saving for retirement. The other account you should get is a Roth IRA. And ideally, you have both. A Roth IRA is one of the best deals for long-term investing. To open up a Roth IRA, find a brokerage account. There are many out there so I highly suggest shopping around and taking a look at the options out there. A few brokers we suggest, though, are Charles Schwab, Vanguard, and E*TRADE. Also, it’s worth noting that there’s currently a yearly maximum investment of $5,500 to a Roth. (This amount changes often so be sure to check out the IRS contribution limits page to keep updated). First, set up an automatic payment plan (which we’ll explain how to do later) so you’re automatically depositing money into your Roth. Second, decide where to invest your Roth money; technically you can be in stocks, index funds, mutual funds, whatever. But we suggest investing your money in a low-cost, diversified portfolio that includes index funds such as the S&P 500. The S&P 500 averages a return of 10% and is managed with barely any fees. For more read our introductory articles on stocks and bonds to gain a better understanding of your options. Ramit also created a video that’ll show you exactly how to choose a Roth IRA. Like your 401k, you’re expected to treat this as a long-term investment vehicle. You are penalized if you withdraw your earnings before you’re 59 ½ years old. You can, however, withdraw your principal, or the amount you actually invested from your pocket, at any time, penalty-free (most people don’t know this). There are also exceptions for down payments on a home, funding education for you/partner/children/grandchildren, and some other emergency reasons. But it’s still a fantastic investment to make — especially when you do it early. After all, the sooner you can invest, the more money your investment will accrue. Once you have your system automated and you’re investing consistently into your Roth IRA and 401k, then congrats! You’re already ahead of 99% of the population when it comes to taking control of your personal finances — and on your way to beating the average retirement savings. You’re well on your way to wealth and living a Rich Life — but it shouldn’t stop there. 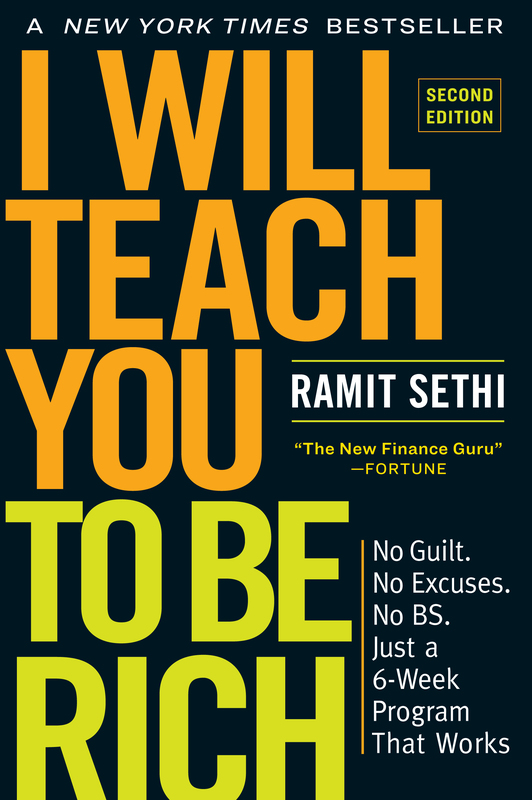 Ramit goes into even more detail on investing in Chapter 7 of his New York Times best-selling book, I Will Teach You To Be Rich. You can get the entire chapter, free, below. In it, he covers the nitty-gritty of maintaining your investment accounts, asset allocation, and rebalancing your portfolio to maximize returns. I know: There’s a ton to cover here about making the most out of these accounts, but if you’re a weirdo IWT reader, you’ll love learning about it.